The Golden Globe Race 2018: an overview of the race concept. This video provides an excellent overview of the GGR 2018 scheduled to launch on July 1st next from Les Sables d’Olonne (Fance), one where the skippers will navigate around the globe via the three capes: Cape of Good Hope, Cape Leewin and Cape Horn before heading back home to Les Sables d’Olonne. The race will be preceded by a fun sail from Falmouth, the 1968 departure point, starting on June 14, that will allow contestants and company sailboats to celebrate this type of retro race prior to departure from Les Sables on July 1st. 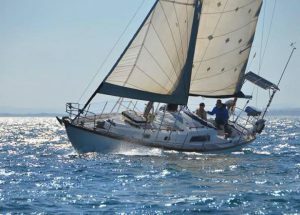 A number of top sailing celebrities such as Sir Robin Know-Jonston, and historical sailboats will be on hand for the occasion.